Tickets for concerts can be purchased online at any time, or through the Montalvo Box Office either in person or by phone: 408-961-5858. Box office hours are Monday-Friday, 10am-4pm and 1 hour before each concert. No. Once you have purchased your tickets, there are no refunds or exchanges allowed. Please check your ticket information carefully when purchasing. Where do I park for Carriage House Theatre concerts? Parking for concerts in the Carriage House Theatre is on-site at Montalvo. We recommend arriving 30 minutes prior to the show and parking in either Lot 3 or Lot 4. For most Carriage House concerts, parking on site is $15 per car; be sure to check the details closely to see if you need to purchase parking. As a courtesy to our neighbors, please do not park on streets surrounding Montalvo Arts Center. Click here for driving directions from Montalvo to West Valley College. Check event information for exact lot number at West Valley. Signs will also be posted to direct you to our designated parking area. Free shuttles between the parking lot and the venue entrance will run throughout the evening beginning 90 minutes before the show starts. Wheelchair-accessible shuttles will be available. You do not need a parking pass for your car. Just park and proceed to the shuttles. Concert tickets are not required to board the shuttles. Will Call concert tickets can be claimed at the Box Office, located near the Garden Theatre entrance. If you purchased an on-site Parking Pass: Please proceed to Montalvo and present your on-site parking pass. You will be directed to a parking space. Will Call orders for on-site parking passes are located at the Montalvo entrance gate. How do I purchase parking passes for concerts? For Carriage House concerts, parking can be purchased by visiting the individual event page and clicking on the "Add Parking" link under the event description. You can also pay at the gate (cash only). NOTE: For many events at Montalvo, on-site parking is free. Check the individual event page for information about parking fees and shuttles. For Summer Concerts, on-site parking and gate entry open 90 minutes before the show. Shuttle service begins 1hr 45min before the show. For Carriage House Theatre concerts, parking opens 90 minutes prior to showtime; doors open 30 minutes prior. Will Call concert tickets can be claimed at the Box Office, located near the Carriage House Theatre and the Garden Theatre entrance. Will Call orders for on-site parking passes are located at the entrance to the on-site parking lots. If the concert is not sold out, tickets are available at the Box Office day-of-show. Box Office opens 60min before each show. A variety of foods -- along with beer and wine -- are available for purchase at each Summer Concert. Only beer and wine are available at most Carriage House Theatre shows. You can bring a picnic and enjoy it on the grounds before the show. For Summer Concerts, the Great Lawn will NOT be available for picnicking. Please, no glass bottles. You may not bring your own alcohol. Can I bring in glasses and/or a small soft cooler with ice? Glass of any kind is not permitted. Plastic is OK. Coolers are not allowed in the Garden Theatre but are OK for picnicking on the grounds. Are there any other items that aren't allowed in? What happens if I bring something that isn't allowed? The following items are not permitted beyond the ticketing gate: tables, barbecues, tall chairs, glass containers, silverware, ice chests / hard sided coolers, oversized bags, sleeping bags, weapons / combustibles, stickers, umbrellas, audio or video recording equipment, laptops, laser pointers, iPads/GoPro cameras, selfie-sticks, or professional cameras. If you bring any of these items, you will be asked to either return them to your vehicle (if you parked on site) or we can check the item for you until you exit the show. How late do shuttles run? Shuttle service back to West Valley ends about 45 minutes after the concert is over. What if I want to buy wheelchair accessible tickets? 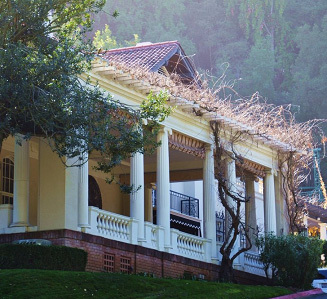 For concerts in the Carriage House Theatre or Historic Villa, call the Box Office at 408-961-5858 with any questions about accessibility or to purchase accessible tickets. Orchestra (rows A - H) and Mezzanine (rows J - HH) are stadium-style seating. General Admission is on wide concrete steps. General Lawn Seating is located on a sloped area near the back of the theatre seating area. There is no back support, and blankets or cushions are encouraged. No lawn chairs allowed. Bleacher Seating is located behind the Mezzanine, with no assigned seats. For a seating chart and other information about the Lilian Fontaine Garden Theatre, click here. Premium (rows A - E) and Orchestra (rows F - P) are all inside the Carriage House Theatre's intimate, 300-seat venue with sloped seating that gives good sight-lines to the stage in every seat. For other information about the Carriage House Theatre, click here.